Group Captain Percy Pickard DSO** DFC tries unsucessfully to shake off the FW190 of 7/JG26 flown by Fw Wilhelm Mayer north-east of Amiens on 18th February 1944. 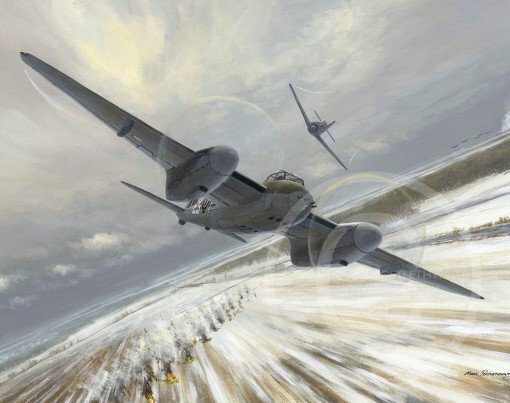 Moments later, Mayer’s cannon shells blew off the Mosquito’s entire tail section causing the aircraft to crash just north of Saint Gratien at 12.05hrs. In the background the Second Wave of Mosquitos are about to bomb the Amiens prison, totally unaware that Pickard who was flying at the rear of the Second Wave had been shot down.